Thanks to all the listeners who emailed me their biggest leadership challenge. Quite a few sent me stories of dealing with change and helping their team members deal with it. So today, let’s mull this over. The big component with dealing with change is TIME. It gives us binary options – we can deal with it gradually or suddenly. That’s also the nature of change. It happens suddenly, or gradually. The change may or may not dictate how we deal with it though. Some changes may be best handled gradually. It can often be valuable to make the changes so subtle – so gradual – that people don’t even notice. Or they barely notice. 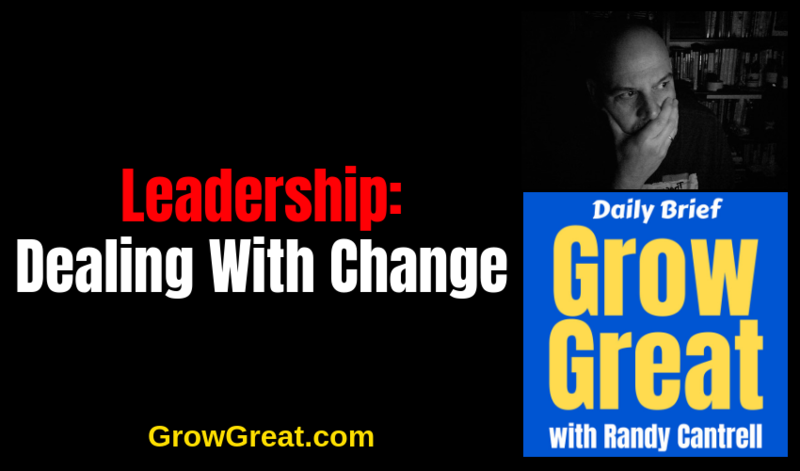 Some of the listener feedback I got was from leaders who wanted to make the changes happen more quickly. They expressed frustration in not being able to “get” their people to follow their lead more quickly. Growth and transformation can take time. First, I’d suggest you consider the growth and transformation you’ve experienced in your life. Think soberly about it. Was it mostly sudden, or did it take some time? It likely took some time. You had to process things and make up your mind, then take meaningful action long enough for those actions to become a habit. Such things rarely happen suddenly. Organizations can more easily accept some change when it’s introduced in smaller steps. It’s less disruptive to their current state. It doesn’t turn their world upside down, but inside makes subtle shifts along the way. Even when people perceive the shifts, they may be more open to accepting it when it has a minimal impact on their daily lives. Not all changes work this way though. When the changes may be necessary, but unpopular or not fully understood this method may be ideal. Or when the changes may not be as critical to time. Things like culture shifts take time. Employee engagement does, too. These are typically changes that demand a gradual approach. It’s like weight loss. You didn’t get fat overnight. You’re not going to get slim overnight either. It may be wise to temper your speed approach. You’re driving down a road at 45 miles an hour. You’ve never been on this road before, but you notice a sign that shows a sharp almost 90-degree curve ahead. It comes up on you quickly and your speed is too high. You frantically hit the brakes to get your speed down. If you don’t slow down you’re liable to end up in the ditch. Some challenges are like that, but most big changes – big improvements and growth initiatives – are not. They’re more akin to a slow, sweeping curve where the steering wheel doesn’t even appear to be moving, but you’re making a dramatic turn. It’s just that the curve is so long it’s almost imperceptible. Your job as a leader is to determine if this change that you’re desiring is best handled slowly, gradually, or if it demands speed. Sometimes you don’t have time to slow down. Speed is required. It’s possible for things to demand speed, and that speed may create chaos that is unavoidable. Many companies operate comfortably one day but are turned upside down overnight. Here in Dallas, last year the Dallas Mavericks NBA team experienced such upheaval. Turns out their top sales guy was behaving poorly toward the females in the organization. The press was blowing up. Suddenly, Mark Cuban, the owner had his hands full. Change was required immediately. It involved firing some top level people and Cuban hiring a new CEO of the business end of things. The behavior was so bad Cuban had no choice. This wasn’t an issue that afforded him to take things slowly and more deliberately. It was a full on battle drill for a few months. I’m sure Cuban would have preferred to have had more time, but the situation dictated the speed. Sometimes the market will do things that to our business. For example, years ago in the luxury retailing business, I was operating there was a major supply problem with the particular glass used in high-end imported electric cooktops. There was no time to stock pile inventory. It happened very quickly with some technical problem in the production of the glass. We had installations pending projected dates of product arrival. Suddenly, we had to manage customers who expected their product by a specific date. The result was a fire drill to honestly and openly communicate quickly the problem and work to solve the problems for customers one at a time. Ongoing improvement and growth can involve both gradual and sudden change. Leadership must manage both, simultaneously. Just here I should give you my bias if you don’t already know it. I’m a speed freak. As small business operators (this also applies to leaders of small teams), it’s an enormous competitive edge. Being nimble and highly maneuverable is a big advantage that I’d prefer to never lose. It’s why I’ve never been attracted to big business. I understand their benefits of scale, but I also understand how lumbering they can be. Lumbering doesn’t appeal to me personally. To each his own. I know the car’s capabilities. I drive accordingly. My son’s wife has a big truck. A monster kind of a thing that I admit I hate to drive. It’s not slow, but it’s big. Lumbering. Sits up high and is anything, but highly maneuverable. It also takes a long time to stop it. On the rare occasions when I drive it, I can’t drive it like I drive my car. It’s apples and oranges. You must know your organization and your skills within it. Dirty Harry’s (Harry Callahan in Magnum Force) quote leaps to mind. “A man’s gotta know his limitations.” Man or woman, you must know yours, too. And your organization’s. How can you help your team or organization become more adaptable? Control is the enemy, but you may not think so. Not valuable control, necessary control, but the kind of control many leaders feel is necessary. Micromanaging. Dictatorial tyranny. You are in greater control than you think. It’s why yesterday we began this week emphasizing that your organization’s success or failure is on your shoulders as the leader. Leadership determines it. So control is important. Your control. But let’s get this right. As the leader, you are in control of your beliefs and you directly influence the beliefs of your organization. As the leader, you are also in control of data input. That is, you control or influence the info gathering of your team. Your job is to assess this data, which includes trends, market conditions, opportunities and challenges. Somebody must be in charge of all this. That someone is YOU. You must control it. As the leader, you are in control of the choices. You make the biggest decisions, the ones with the most impact. You must control that. You can’t let the organization flounder in indecision. And you can’t allow every decision to be made democratically. The organization is waiting on you to make a decision. As the leader, you control your actions. People are watching you. They’re taking cues from you. If you’re an effective leader (you may even be an ineffective leader and it’s still going to happen), people will follow you. Choose your actions wisely. Adaptability demands avoiding as much chaos as possible. I’m a stress junkie and I thrive on chaos, but not just any kind of chaos. Nobody, and no organization can thrive on chaos where things are out of control and panic is ruling the day. Many college football pundits claimed that last week the University of Alabama panicked as they were being whipped by Clemson. Nick Saban, it was argued, panicked and people hadn’t seen that before. It wasn’t pretty if you were a Bama fan. They suffered their biggest defeat in the Saban era. Maybe the negative chaos and panic did them in. Adaptability, managing change, requires one major thing – that leaders prethink. Leaders predetermine what they’ll do before they need to. This greatly reduces or eliminate chaos that would disturb the growth of the company. It enhances your ability to manage change. It’s how you more fully embrace LUG throughout your organization. Learn. Understand. Grow.